I have been hearing a lot about The Honest Co., founded by Jessica Alba and Christoper Galvagin with the goal of providing effective, non-toxic and sustainable baby, child, adult and household items to everyone at an affordable price. 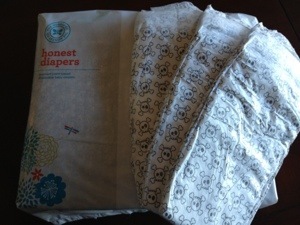 While they do have monthly subscription boxes (or bundles) called Honest Diapers Bundle – $79.95, with your choice of size and patterns (yes, patterns!) along with wipes, or the Family Essentials Bundle – $35.95 (you can mix and match bath and body products along with household cleaners) I chose to test out a package of diapers and wipes prior to committing to a monthly subscription. I will have to get back to you on the actual performance of these but I really hope they work out! !